Training for this race started mid-December on the Jeff Galloway 12 week training plan. I ran consistently 3x per week, even if I didn’t do the speed work. This race was a personal best, but it also had moments of enlightenment. I stopped all ibuprofen the day before race day, and instead iced and used compression on my injuries. I walked quite a bit 4+ miles the day before, and perhaps next time, I can manage my day a little better to reduce the time on my feet. Race day morning included the typical long run breakfast of oatmeal, cranberries, almonds, 1 tbsp brown sugar and cinnamon right after waking up and then nature valley crunch oat bars about 15 minutes before the race started. I had a few sips of tea shortly after waking and could feel the effects of the caffeine so then drank some water to make up 8-9 oz of water per my usual routine. Since this was a race for a decent time, I pulled out the Pro Bar Bolts that contain caffeine (my usual LSD include Pro Bar Bolts without caffeine) and two tylenol (I’ve been battling headaches this week). After a double check of the muni schedule and BART schedule, I set off across the bay with gear bag in hand. This was the first time checking gear. There was no line when I arrived 1 hour before the start but then 15 mins before the start had to wait. Tip about how to secure the gear check bag tag – take the square solid end and wrap it around the string on the bag, then pull the square solid end into the hole on the other end (first enlightening moment of the day). Gear check is certainly nice. No carrying of articles on the course like post-race fuel, gloves or a jacket. 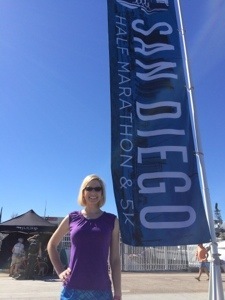 The most important thing I packed was a jacket AND a long sleeved shirt for post-race. I was grateful for the second third layer. In addition, my calf sleeves, sunglass holder, tylenol and advil, tissues, food, and an electrolyte post-recovery drink were brought along. Enlightening Moment Number 2: Utilize the gear check. My sister mentioned that going against the advice of “start out slow” will result in a faster end time and of course I wanted to try this theory, so I aimed for the 2:00 pace group, which would shave 11 mins of my personal best. I figured aim high, but not unrealistic. 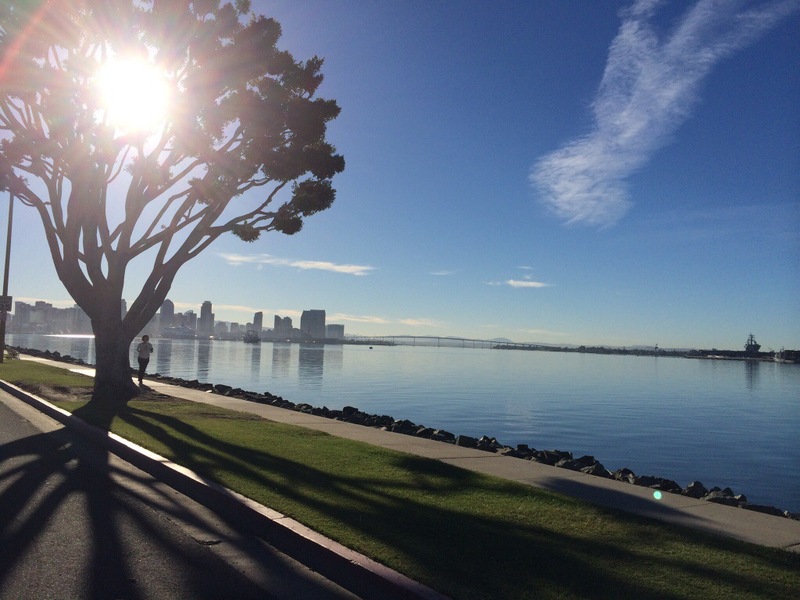 From the one experience at the SD half, the pace groups start out at about the same pace that they end with or so I thought – read on. I’ve contemplated a lot that perhaps I’m just not pushing myself enough, that I’m holding back. So this time, I wasn’t going to hold myself back as much to see what I could accomplish and if I failed, I was going to fail big. Great! I am right on the tail of the 2:00 pace group for the crowded first .5 miles. 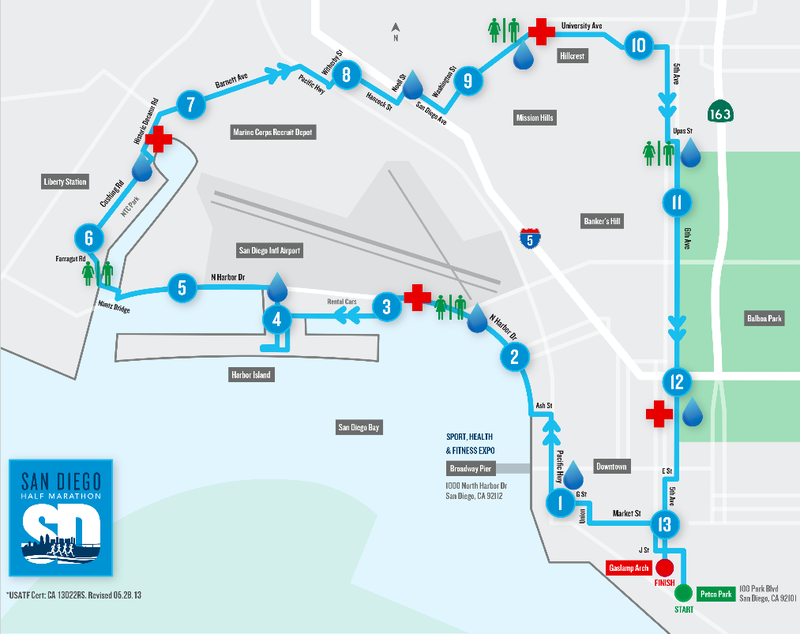 They should really have a wave start for this race – Do I even like this course anymore? Maybe I will skip this one next year. Can’t believe my nike watch didn’t sync to GPS in time, should I start it now? Nah, I should have enough phone battery for the app I started on my phone. I’m still within view of the 2:00 pace group. This will be an intense run, I’m breathing heavier than a LSD. That’s to be expected since I’m going for time. Can I do this for 11.1 more miles? Yes, I can do it. No groin pain! Just passed a wheel chair bound person being pushed – go team Ari! Ok, creepy dude who just nudged and winked at me, I hope I don’t see you again. 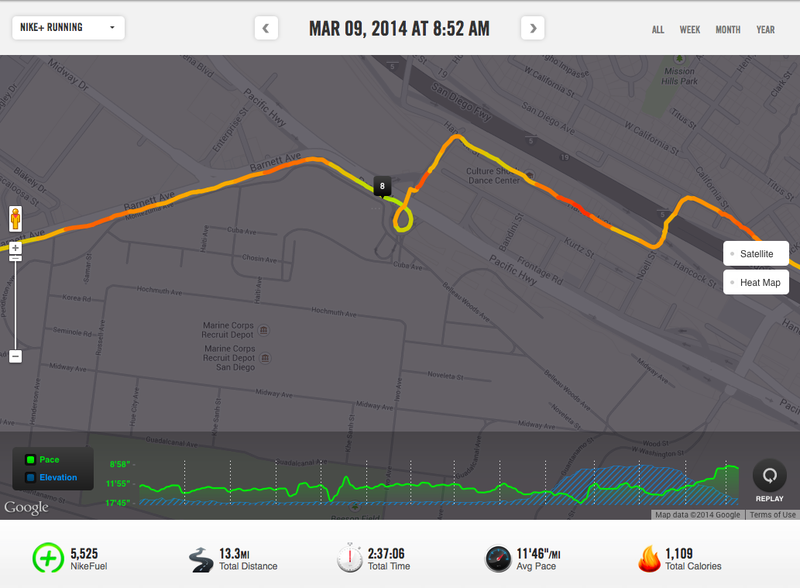 The 2:00 pace group is long gone, but my Nike+ is still boasting a 9:30 pace – Sweet! I see a pace group with 9:54 pace, but what finish time does that translate to? I can’t do the math, focusing on running. TURN THE SIGN AROUND! Darn, they are too far for me to see without my glasses. This S turn at mile 6 is familiar, I walked at this point last year. Oh that was the 2:10 pace group, what? That doesn’t make sense because I’m averaging 9:30. Creepy dude tried to say we were twins because he is wearing a marroon shirt and I’m wearing fuchsia – Yes they are both a shade of purple, but not even close to the same and please stop interacting with me, at this point, I don’t have breath to socialize with you. I’m doing 9:36 average pace. Damn, slipping, but still faster than my PB, just hold this pace. My legs feel like lead when I’m going slower and shuffling, but if I focus on form, increase my stride and lean (which in turn, I go faster) I feel like I’m exerting less effort. Enlightening Moment Number 3: Practice speed. There is the bronze/copper arch – smile for the camera on the other side! 9:39 pace WTF! You can do this, just focus on form on every run segment. I MUST catch up to the 2:10 group before the next walk break. Remember, you do have walk break so KEEP RUNNING. What? The 2:10 pace group just said they’ve been going a minute fast and will need to ease up – WTF, aren’t they supposed to be PACING! Oh crap a random camera person while I’m walking, better run then take my walk break after I pass him. I LOVE howling in tunnels. I haven’t been thanking nearly enough volunteers on this course, I will make up for it next Saturday. There are lots of people cheering, can’t take a walk break here. Hey, where is the photo setup for the photo taken from above with the painting on the ground as the backdrop, that was a cool photo last year. There’s the lake, just a 5K left – You can do this, no, you ARE going to do this. I remember they position a camera person at the top of the hill by the gazebo, can’t take a walk break till after! Smile! Just one more walk break and then I’m done. Ok, maybe 1.5 walk breaks, I can still see the 2:10 pace group. Another camera guy!? Don’t think about the hill, don’t think about the hill. Am I even moving? Where is my friend? Curse this hill. Ahh – up and over. Oh cool! I heard my name over the loud speaker! Where is my friend? After running a hard race like this, my preference is to take life slow, grab food, water, stretch, then obtain wine, and find a sunny spot to continue stretching, do some people watching, eat and just rest. I realized this because my LSD running buddy showed up and I felt the need to entertain… to “do” instead of just pulling up a green sunny patch of earth and resting, which is all I really wanted – well that and a bag of cheetos. Enlightening Moment Number 4: Hard effort races require downtime after the race so solo is best unless that person just ran that hard effort with you. I appreciate her coming all the way to see me, but I failed to have the energy to be the engaging friend (I took the tactic of asking her a bunch of questions so she did most of the talking). After a stretch and obtaining my two glasses of wine we wandered around the after party before leaving for lunch in the city. Quite happy with no back pain or knee pain post race! So aside from my groin injury, I’d say that I’ve had the least amount of post-race soreness. The lack of back pain, I attribute to the simple back stretches I started doing three days prior to race day. My feet (facia) had sharp pains at time, the days leading up so I wore compression socks for a few hours during the night the night before the race and also wore my compression tights the night before the race for 3-4 hours. Perhaps those helped with the delayed soreness of the calves during the run. Pre-race Injury: Left groin pull. During: Left groin pull and calves around mile 9-10 but otherwise great beforehand. Post Race: Left groin pull is significant, right calf soreness more significant than left. Do you take notice and smile for the cameras, why or why not? Yes, even though I typically don’t purchase the photos, smiling provides a subconscious boost to your energy and mental state. Taper week starts tomorrow, one week before race day. The Jeff Galloway Half Marathon training plan (Time Goal Runners) calls for 5 miles. This past week has been a taper week for me since I’ve been home with a cold. I didn’t skip my training runs but did reduce from what I have been doing (from 5-6 down to 2.5-3 miles). This cold happened at the best time, the weekend right in between two of my three half marathons this month. 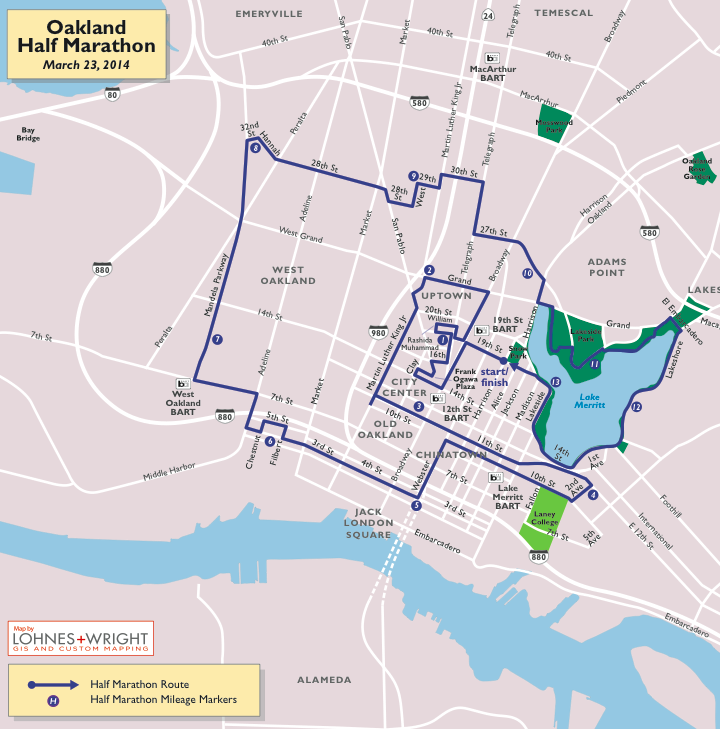 I’m really excited about the Oakland Half Marathon on the 23rd. I was/am hoping for a PR but if that doesn’t happen (I skipped most of the speed workouts), I will still be pleased at the strides in fitness I’ve made this year. The training was different this time around – weekday short runs were longer due to a local running buddy and every few weeks, I incorporated hills into the short weekday runs. Taper week for me includes mental prep: What am I doing the day before the race, what will I eat the day before and planning logistics for getting to the race. For next year’s half, I will certainly follow this training plan again and adhere more closely to the speed workouts. In addition, a running buddy with similar ability certainly has proven to be important for increasing endurance and confidence. What is your favorite part of taper week? We high tailed it down to the expo before it opened and beat the crowds. Maybe because it was the first time in skirts since last fall or just the excitement of the weekend plans. We took a swag lap around all the booths after picking up our bibs and technical t-shirt then ended up at the booth with headbands and SD half gear. I purchased a few headbands and wore one of them during the race. I typically cover my ears in the city because of the cool wind but these destination races call for just a head band to hold my hair back. The afternoon after the expo was spent walking around La Jolla with lunch overlooking the cove. I fueled like I would for a typical long run, which meant lots of water and anything goes except for alcohol. Next time my choices will be a little more selective because the salty fish tacos and corn chips were probably the cause of the swollen hands and feet post-race. We arrived with plenty of time, there were plenty of portapots (thank goodness!) for the 6000+ participants. 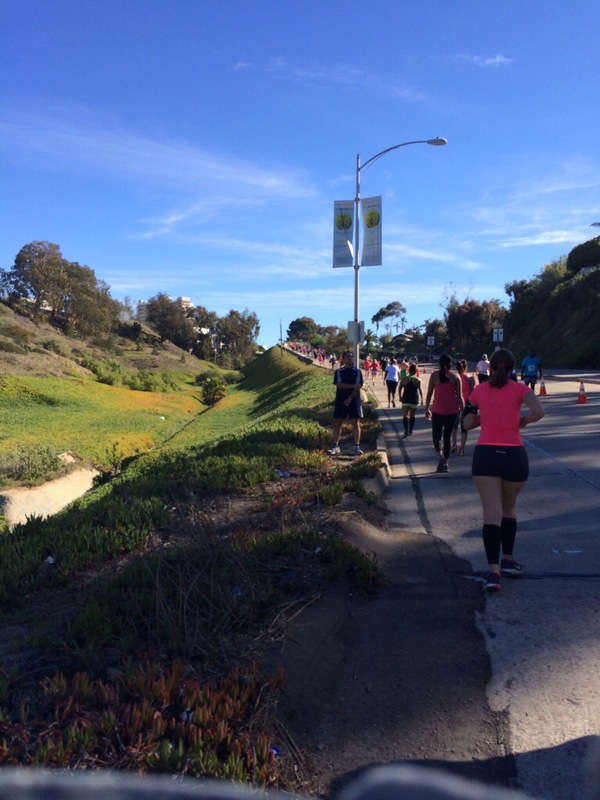 We were wave 14, this was my first experience with a wave start for a half marathon. 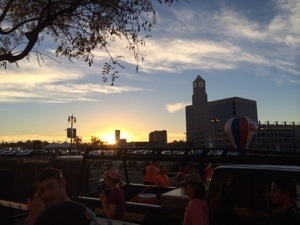 While we waited, I captured a great photo of the San Diego sunrise. Many times during the 35 minute wait, I had to remind myself that this was a training run – a leisure run – and that’s why we were with the 2:45 pace group. I have quite a competitive nature, this was probably the most difficult part of the race. =) My internal goal was to stay with this pace group at least till the very end, then if we felt good, pass them. The waves went off about 20 seconds or so apart except for a few of them, which were held at the start for 7 minutes so they wouldn’t have to wait for the trolly to pass on course. 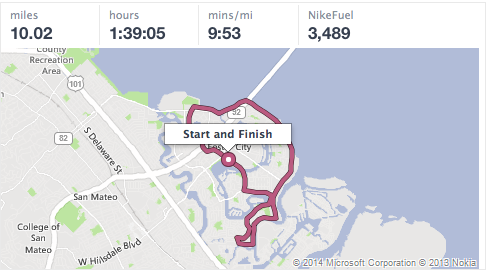 The next few miles took us past the Broadway Pier where the expo was held, then we headed toward the airport. We saw some airplanes landing so close, it was pretty cool. My sister needed to use the portapot and at 3.75 we saw one on the other side with an aid station. We were doing a run/walk and there was only one portapot so I told her to go on ahead and I’ll catch up with her. I took a moment to capture this picture for her. At the time, I didn’t realize how beautiful it would come out wit the sun shining through the tree. My 12 day old groin pull was now warmed up and was allowing my stride to increase so we picked up the pace to catch up with the 2:45 pace group after the potty stop. Mile 6-7 took us along a beautiful park with decommissioned cannons. This is the moment that I realized the race was going by in a blur because we had been running by this park for a few minutes already. The water stations were now out of water and electrolyte fuel. Disappointing and sad that the people who may need it the most, 3:00+, don’t have this vital necessity. A person from the first-aid station was giving out water bottles. We grabbed one to share between us. Half empty water bottles are not the friendliest things to carry on a run. With the temperature above 60 and aid stations running out of water, we had no choice. Again, it’s was just a leisure run. There was a fun 270 degree exit with an underpass/tunnel at the Marine Corp. Recruiting facility. I made sure to hoot and holler in the tunnel. By mile 9 we passed the 3:00 pace group and caught up to the 2:45 pace group. Perfect timing because we encountered an awesome 1 mile, 300+ft elevation increase (i.e. hill). The pace group was alone and one of the few around us who were still running. We ran with them for a bit then pulled ahead. During this hill, we took our scheduled walk breaks and continued the strong climb. We finished strong at the top. Up and over. Half way up, I took a photo. It was a great hill. My sister from flat Indiana crushed it. We had passed the 2:45 pace group so we slowed our pace to conversation pace after passing through the Hillcrest neighborhood. The chatting picked up on the 3.1 mile downhill to the finish. We passed the west side of Balboa Park. The after party was at AT&T park, but we were ready to get back to the hotel. They provided a generous goodie bag with an orange and banana, along with chocolate treats. After a finishers photo, texting our loved ones and a walk through a local market (not part of the SD half), we slowly made the walk back to the hotel. How many half marathon’s have you completed with the intent of it being a training run or a leisure run? Some ladies I follow on twitter (@fitfluential, @happyfitmama, and @RunningEscapade) signed up for a 14 in 2014 challenge. I’m intrigued. I’ve already committed myself to five long distance races this year, so an additional nine 5Ks should be easy to squeeze in… also they are providing four virtual races, which would be something new. The first race of the year, for me, was actually today. It was a brisk morning but the sun was coming up as I walked to the start line, a perfect day for a 10 mile race. I chatted with folks along the route and said thank you to the many many police-persons and volunteers. I started plotting out 1 race per month, thinking I could do 12 in 2014, but perhaps 14 in 2014 is doable. It’s a lot of dough to shell out ($600+), so checking into the virtual runs may be a good idea. I will ponder some more, though doing the Thanksgiving to New Years Eve 35 day Runners World Holiday Running streak was a lot of fun.